WORD UP: Experiential Marketing with WORD UP (the Biggest Spoken Word Poetry Event in Nigeria). 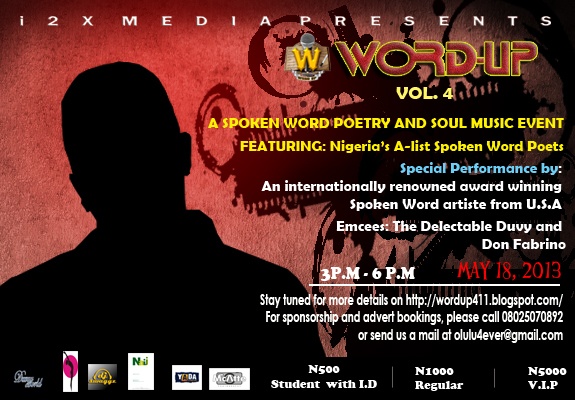 Experiential Marketing with WORD UP (the Biggest Spoken Word Poetry Event in Nigeria). Truth be told, nothing sells a brand faster than Experiential Marketing. Picture this: it's 3:00 pm on a Saturday evening. A hall full of people applauds as their eyes stay glued to the stage. There is anticipation in the air. The excitement is palpable. Adding the needed colour and glamour all across the hall is the Brand behind the excitement. The people lose their voices as “he” steps on the stage. They influence, persuade, tweet, retweet and share their experience over social media, while others try to make their way to the venue even as your brand meets them at every point. They can’t wait to hear the sound of “The internationally renowned spoken word artiste,” on the shores on Nigeria for the first time. They can’t wait for YOUR BRAND, to make this happen. Here’s introducing i2X Media Company Limited, the organizers of WORD UP -the biggest Spoken Word Poetry Event in Nigeria. Since 2010, we have grown Performance Poetry and Spoken Word, working tirelessly to promote the art in West Africa and position it as a genre of entertainment, a tool to increase literacy level, and a means of communication among people across the globe. This quarter we have plans to bring in an international poet from the United States of America to influence our poets here and further grow the industry. Your love for art and the entertainment industry has led our proposal right to you. The question is why not? Every quarter, poets gather from across the globe at our quarterly organized show – WORD UP. WORD UP (SPOKEN WORD POETRY AND SOUL MUSIC EVENT): is a show that features the best Spoken Word Poets in Nigeria all on one stage. It is a major platform for poets across the globe. Previous editions saw poets from the Namibia, England and America grace the stage. We also feature celebrities who come on stage to read, recite and/or perform poems. We have held three editions of WORD UP in UNILAG, Akoka, Lagos supported by Charvet Nig. Ltd (major marketer of Power Horse energy drink and Kiss Mix), First Bank of Nigeria Plc, Airtel and Smooth FM. We request that you partner with us through sponsorship to showcase your products and services and portray your brand as one with a passion for development of the art and the average individual. We understand that businesses exist for profit and the current economic situation requires granular analysis of your marketing spend. This is why working with our partners, we have designed special sponsorship plans to drive your marketing efforts. Sponsorship of WORD UP provides you the under listed which can be further explained at our initial meeting. · Database Acquisition and so much more. Don’t take our words for it, please visit http://wordup411.blogspot.com/, where pictures, videos and information about our events and the organization can be accessed. While you are at it please feel free to check out our YOUTUBE channel, http://www.youtube.com/user/olulu4eva?feature=mhee, for video clips of some of our events. Platinum, Diamond, Gold, and Silver. We are open to further discussions should you decide to pick any of these options. The next edition of our event, WORD UP Volume 4 (Spoken Word Poetry and Soul Music Event) is on May 18, 2013 and will hold quarterly thereafter. Performance Poetry and Spoken Word Event is the next tidal wave that will sweep through Africa. The good part is it captures all genres of people, and creates job opportunities for our youths. Do not miss the opportunity to ride on the waves. We can’t wait to read from you so we can work together and achieve our objectives.